It's back to the drawing board for Pittsburgh Penguins general manager Ray Shero. Shero had hoped to bring in Zach Parise to play on the left side with Sidney Crosby and Ryan Suter to anchor his defense. But neither opted for Pittsburgh -- both players signed Wednesday with the Minnesota Wild, leaving Shero to look for other alternatives. "It took four days and we respect the process; they're both obviously really good players and they both ended up with the same team in Minnesota," Shero said during a conference call. "Zach is a really good two-way player, and we thought he'd be a really good fit here in Pittsburgh, short- and long-term. Same thing with Ryan Suter, a top defenseman -- these guys are hard to find. "As a free agent, they both had the ability to choose where they wanted to play, and they both chose Minnesota." Shero said the Penguins made what he called "very competitive offers" to both players, but that there was never anything close to a deal with either player. "We never got close to anything like that, in terms of any kind of verbal agreement or any sort of negotiation," he said. "It became pretty apparent over the course of a couple of a few days that Ryan probably wasn't coming this way. In terms of Zach, we didn't know what was going on until later last night. They got together and did their thing. That's what they wanted to do, and we respect that. "They went to the place they felt was best for them professionally and personally." Shero especially would have liked to put Parise on the left side of Crosby, who's had numerous partners in his seven NHL seasons. "If we could find a long-term winger for Sidney, that would be fantastic," he said. "But as you can see, they're not falling off of trees here. You have to patient, and if there's a chance to get someone like Zach Parise, as we just tried to do, it makes a lot of sense. That's why we tried to do it." With plenty of cap space and assets to work with, Shero and the Penguins are in good shape despite not landing Parise or Suter. In Crosby and Evgeni Malkin, they have the NHL's best one-two punch at center. James Neal scored 40 goals on Malkin's left and was a First-Team All-Star, and veterans Chris Kunitz and Pascal Dupuis are coming off their best seasons. Even without Suter on defense, the Penguins have an All-Star in Kris Letang and a solid support group. "They're both obviously really good players and they both ended up with the same team in Minnesota. Zach is a really good two-way player, and we thought he'd be a really good fit here in Pittsburgh, short- and long-term. Same thing with Suter, a top defenseman -- these guys are hard to find." "We like our defense the way it is," Shero said. "If we have the ability or the chance to upgrade, certainly we'll do that. A lot of teams are looking for defensemen now and they're difficult to find. We'll go with what we have at this point. The same thing up front -- we'll see exactly what might be available, whether it's trade-wise or -- we know what the free agent market is. We'll go through the summertime and see where we are as we go. "One thing we do have that we haven't had in a while is cap space. That's something we can bank on moving forward, and we'll see where that takes us." For now, that means checking out the remaining free agents or possibly looking for a trade partner. But Shero is also aware that he's not exactly starting from scratch -- his team did finish third in the Eastern Conference points race this past season despite missing Crosby for much of the season. "We like our team," he said. 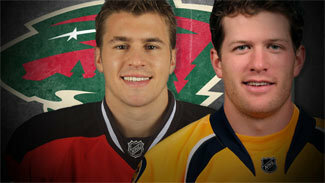 "Adding a guy like Parise and/or Suter would have been fantastic. But we've got two First-Team All-Stars coming back at forward with Malkin and Neal, and adding Sidney Crosby -- that's a pretty good lineup already. "We'll do our homework and see if we can upgrade our team at some point. We'll see what the summer brings us."